Challenge: Movement. How do you show movement in your photos? This photo choice is a very deliberate show of movement through the camera lens and the blurring lights, but how else can you show movement of objects, or of the action that’s happening in your picture? 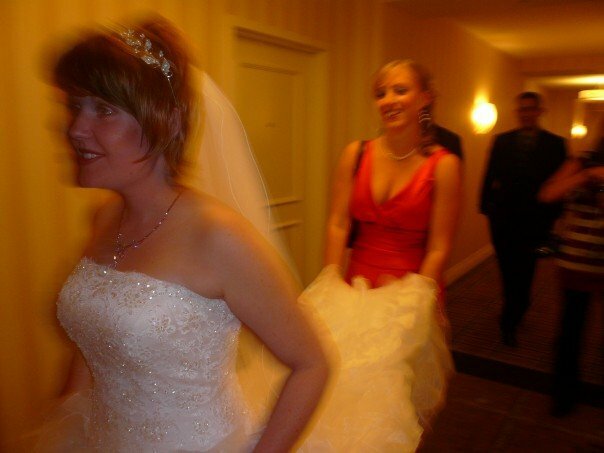 In 2007 my older sister, Charlotte, got married. She was the first of the four girls to get married, so we were all bubbling over with excitement. As we were rushing down the hall of the hotel towards the ballroom, I turned around and snapped this photo. It is still one of my favorites from her wedding day. We were nervous, excited, and literally running down the hallway. I like how the photo seems to be “buzzing” and it’s a little blurry, it reflects our feelings that day!